I’m glad I got a place! Others were not so fortunate so it made it more important to speak out if given the chance! Coming from the coast, it was agreed the Carers from our area would travel up together so we left the night before and stayed the night in Edinburgh. This was a good idea, it gave us time to get to know one another a little bit too. 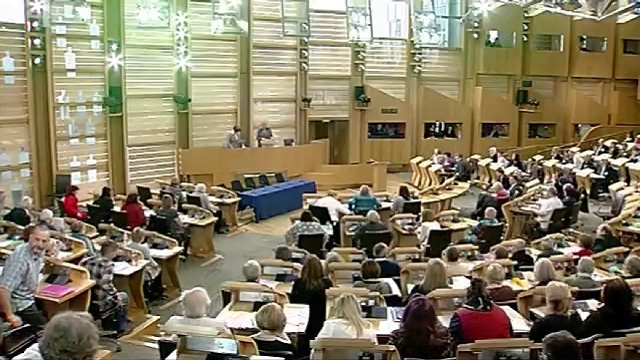 I felt nervous and excited on the actual day, I also felt a responsibility to try and raise the issues I knew were important to Carers across Scotland! We, the lucky ones who got a place, really needed to hold our nerve and find our voice - tell it how it really is for Carers! There was a buzz about the place, people were excited and there was an air of expectancy too. People really didn’t hold back, they wanted to share their stories and highlight what does and doesn’t work for Carers in today’s Scotland. I think the greatest impact of the day came when Carers not only asked their questions in the chamber but shared a little bit of their life, the struggles but also the triumphs when things worked well. I struggled on alone for over twenty years before accessing some help and respite – it was a difficult time. Meeting other Carers at the Parliament, those who are still struggling on alone with little respite or assistance brought it all crashing back to me. Just how isolating and life limiting long term, things can be, for Carers themselves. I came away with a feeling of satisfaction, we were listened to, ministers did respond positively. This was tempered with a feeling of bitter-sweet, I’m no longer in the unsupported dark days in my caring role, I have help now but other Carers are still struggling in darkness with little help or respite, that left me incredibly sad, there’s still such a long way to go. It was a wonderful day. It raised awareness of Carer issues and hopefully opened the door for further changes that will benefit all Carers.